And so to the culmination of the 2018 season, the 10th playing of the ATP Finals at the O2 in London. This time last year, two new names contested the most prestigious title of the ATP tour, and perhaps two unexpected names. Six-time champion Roger Federer lost in the semis, the then No1 Rafael Nadal was forced to withdraw after one match, defending champion Andy Murray was absent injured, as was five-time champion Novak Djokovic. It opened the door for fresh blood, and Grigor Dimitrov duly stepped up to beat David Goffin. This year, the 37-year-old stalwart of the tournament, Federer, was back again, but again lost in the semis. However, Djokovic was back in contention—and not just in contention but the favourite to equal that Federer record of six titles. And such was the run of Djokovic through the last six months that he surged from a low of 22 at the French Open to the very top via victories at Wimbledon, the US Open, and the Masters titles in Cincinnati and Shanghai. Add in final finishes at Queen’s and the Paris Masters, and he was on a 35-2 run since the start of Wimbledon. The ATP’s Comeback Player of the Year continued his blistering form in London: Thus far, he had held all 36 games en route to the final and faced only two break points in the process. To put his achievements into context, the last player to win the year-end title without losing a set in the tournament was Alexander Zverev’s new coach, Ivan Lendl—in 1986. 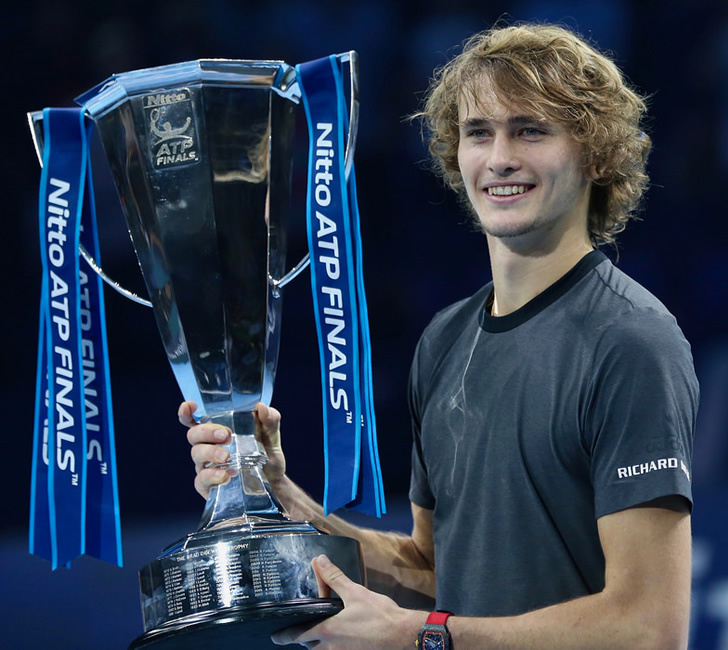 And talking of Zverev, here was the leading light of the #NextGen who was so good at 20 years of age that he qualified here last year, and now with three Masters to this name, he had done so again. This time, though, rather than losing to Federer in the round robins, he beat the Swiss, and that earned him his biggest final to date. And the young German had won a lot of fans here with his big-time tennis and bold attacking mind-set. He then coped with an emotional winning interview—after an incident in the concluding tie-break with Federer that was not his fault—with sensitivity and courage. So confident and assured on court and in media, here was the vulnerable side. Zverev’s chances of taking out the No1 seed after dismissing the No2 seed, however, looked slim. His one win in three over Djokovic came on the clay of Rome last year, when Djokovic was already having a few elbow problems. This year, the Serb had dismissed him in short order in Shanghai, 6-2, 6-1, and more pertinently, this week in the round robins, 6-4, 6-1. And while Zverev had been serving superbly, notching up 42 aces in four matches, and winning 80 percent of first serve points, he had been broken—six times. Djokovic, in comparison, was impenetrable. 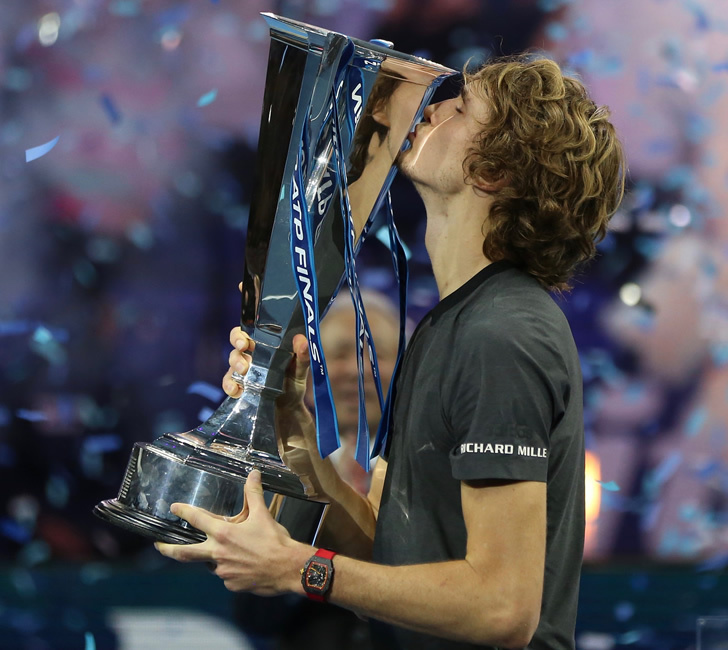 But while Djokovic aimed to become the oldest champion at the O2, Zverev was aiming to be the youngest since Djokovic himself in 2008 in Shanghai. And it quickly became clear that he believed he could do just that. In the second rally of the first game, they went long and hard from the baseline. It drew the error from Zverev but the crowd was already in the mood for more of the same. The German thumped his first 139mph ace to close out the second game, and put two more quick holds on the board, showing himself both willing to rally from the back of the court but to come to the net, too. He already had the edge on the serving front, 84 percent finding their mark, and just three points dropped altogether on serve, 4-4. Now the German had a break point, too, and Djokovic netted a tight forehand to concede his first break of the tournament. But could Zverev serve out the first set? Three aces were a good start, and he drew another error for a strong hold, 6-4. The packed O2 roared: It had been a bold, big-time set of tennis from the young man. Zverev was, as is his habit, in no mood to sit around: More often than not he heads to the baseline before time is called, and did so now. Immediately, he had another break point, saved by a big precision serve from the Serb. But Zverev got another chance with some resilient baseline defence and power striking. He bided his time and hammered a winner down the line to break, 1-0. But the nerves suddenly took a hold, two double faults and a wild backhand wide handed the break straight back. Cool as you like, though, he jumped on some second serves from Djokovic to break again, and although his own first serve went temporarily AWOL, he held, 3-1. Djokovic, who began to look weary after his heavy schedule of the last six months, did manage a love hold, but Zverev saved a 0-30 threat with four straight points. He then kept up the pressure in the eighth game, an ace to open, his 10th of the match, and a quick hold. And now Djokovic looked spent. A loose service game, and Zverev punished him with strong hitting from the baseline, and it brought one last break, for set, match and the biggest title of his young life. He fell to the ground, and the always generous loser came across to embrace and congratulate him. The O2 arena, from jeers and boos after his victory over Federer yesterday, had now taken this bold young player to their heart and roared their approval. Yes, Zverev has picked up Masters titles since he transitioned from teenager to top-five player, and yes he had faced questions about when he would break through for a still bigger title. Watch out, 2019: There’s a new kid on the block.